When international travelers think about hiking in Europe, their first thought is usually "Alps in Western Europe". But there are so many other spectacular mountain ranges in Europe. Which ones? - you may ask. Let's consider today Slovakia and Poland - the most interesting Central Europe countries. So, what makes them so special? The answer is: Tatra National Park. 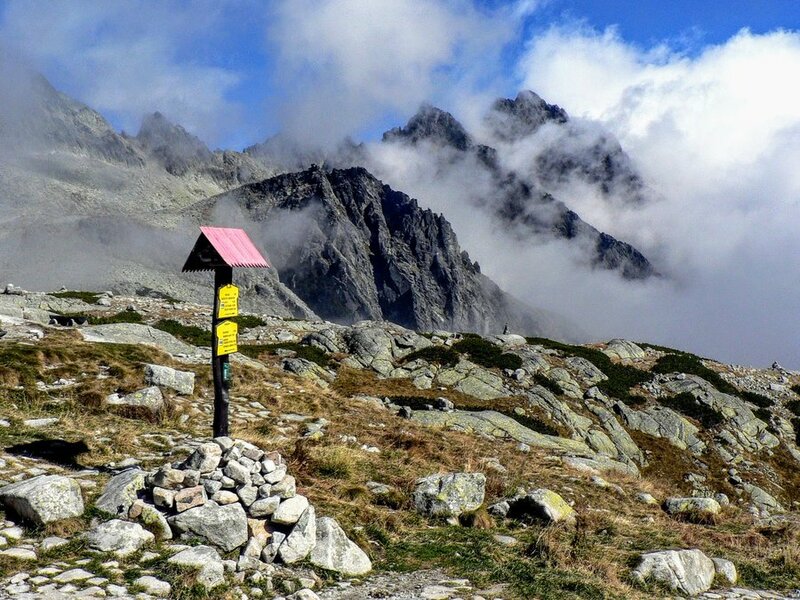 For many outdoor enthusiasts Tatra mountains are one of the best places to hike in Europe. This amazing region is divided between Poland and Slovakia. In Poland it is called TPN (Tatrzanski Park Narodowy) and Slovaks call Tatra mountains TANAP (Tatranský národný park). Regardless of the country, Tatra mountains are equally amazing, they're one of the most beautiful mountains in Europe. Also, they're the only Polish mountain range of alpine characteristics in this part of the continent. Unique flora and fauna and valuable ecosystem make Tatra mountains a national heritage which is officially protected as National Park. You'll find fantastic hiking trails there - some of them suitable for a quick one-day hike, some for a family walk and the other perfect for backpacking. There are also nice ski resorts which can compete even with Western ski resorts! However, there are a few differences between Polish and Slovak Tatra National Park. As we can see, the highest Polish mountain isn't even in the first eight most elevated peaks. It's another thing which makes us Poles envious of our southern neighbours - Slovaks have definitely more Tatra mountains than we do. Total area of Tatra mountains is 785 square kilometres, 610 km of which belongs to Slovakia. That's a lot! Also, total length of trails is longer in Slovakia - it's 651 km. In Polish Tatra mountains there's only 275 km of hiking trails. Tatra National Park trails in Poland are dense and well-connected. It's rather easy to get from one point to another. Slovak mountains are bigger, so the trails are longer and more dispersed. If we decide to hike a typical long trail (so common in Western Tatras) we need to plan our trip well and be prepared for all outcomes. There's little possibility to change plan in the middle of the hike and just choose another trail. I think hiking in Poland is easier, especially if you're interested in day hikes. I say Polish trails are shorter and more densely distributed - sometimes you can even see one trail from another, which doesn't happen often in Slovakia. Also, there are more hiking trails in Poland. When you get to a mountain hut in Poland you've got many trails to choose from. Generally, planning a hike in Polish Tatras is easier, can be more flexible and spontaneous. Maybe it's because there's definitely less people living in Slovakia (only 5.4 million compared to 38 million of Poles) and the majority of Polish hikers prefer Polish mountain range. In addition, there are the factors mentioned above - Slovakia has bigger area and longer trails which smooths out the traffic. I'd also say that mountains have become very popular Poland holidays destination. Especially Tatra mountains got kind of more fashionable for holiday makers in recent years. Polish Morskie Oko lake or Kasprowy Wierch peak are examples of very crowded spots - I have never seen so many people in the mountains as in those places. This may seem a bit weird but I swear when I drive in mountain regions in Poland I see more banner ads than in Slovakia. Is it because of less potential consumers traveling to Slovak Tatra mountains? Or is it simply the fact that Slovaks just don't want to spoil the landscape with Auchan buy-two-get-third-for-free promotions or plastic surgery propaganda? If you're thermal pools aficionado (I love them!) or traveling with kids who love waterparks, then Slovakia is a better option. No that there are no water parks in Polish mountains, not at all, but simply there's more of them in Slovak part of Tatra mountains. Also, Slovak waterparks are generally bigger and, most importantly, have more waterslides. In Slovak Tatra mountains rescue operations are done by HZS (Horska Zachranna Słuzba). Like Polish TOPR (Tatrzanskie Ochotnicze Pogotowie Ratunkowe), HZS will help every hiker who's in trouble. But there's a difference in financing such actions - HZS will charge the "customer" who called for help, whereas TOPR is funded by the Polish government and money coming from the tickets. In Poland, you need to pay an admission fee when entering Tatra National Park but rescue actions are for free, and in Slovakia, it's the other way round. So, it's necessary to buy travel insurance before visiting Slovak Tatra mountains. It's worth to pay a bit more for the insurance as it has to cover rescue operations (helicopter can cost up to a dozen thousand Euros). Also, let's not save money on insurance even if you only plan to hike in the valleys - you can get bitten by an adder and need immediate assistance. Traffic in Tatra mountains in Slovakia is more limited than in Poland. Hiking trails are closed from November 1st until June 15th. We can only hike up to the mountain huts, but if there is high avalanche risk, TANAP authorities close Tatra National Park completely. If a mountain guard catches us on the trail, we will most probably pay through the nose for a fine. The only mountain allowed to climb in wintertime is Predné Solisko (2117 m) in High Tatras Slovakia. The peak is located near Štrbské Pleso mountain resort and about 1-hour hike from Chata pod Soliskom mountain hut. In Poland, there is complete freedom in wintertime, which results in a higher number of accidents. TANAP doesn't charge tourists for entry into Tatra mountains - hiking in Slovakia is free of charge. In Poland, every adult needs to pay 5 PLN. Children entrance fee is 2.5 PLN. Hiking outside officially marked trails in Tatra mountains isn't allowed without certified Tatra mountain guide. In Polish Tatra mountains there are hardly any unofficial trails. The most popular option in Poland is Mięguszowiecki Szczyt Wielki (Mięguszowiecki Grand Peak). It reaches 2438 metres and it's the second highest mountain in Poland. The same as in Poland, hiking unmarked trails in Slovakia is only allowed with a certified mountain guide. The same rule applies to every ascend above 2500 metres. We also need to inform TANAP authorities about our hike, how many people are climbing and the guide's name. Tatra mountain guide can take 2-4 hikers on one trip. Tourists are connected with a guide with a rope. In some cases, it's not necessary to have climbing skills, but experience in high mountains is needed. The main difficulty is finding the trail which is the main job of a mountain guide. Cost of certified Tatra mountain guide is about 100 EUR per person. 11. What about dogs in Tatra mountains? If we wish to hike with our pet, then Slovakia is definitely a better choice. Dog are allowed practically everywhere and it is the owner who decides where he takes his doggie. In Poland, the only trail we can hike with our pet is Chocholowska Valley. If you're looking for cheap places to travel, then Tatra mountains regions is a good choice. Below are some of the places we've stayed in. Some are cheaper, other a bit more expensive, but still, it's nothing compared to Carpathian mountains in Western Europe. Located in Horný Smokovec, part of Vysoké Tatry town. This option is great if you want some comfortable luxury. It's a beautiful place offering spacious apartments with mountain view. Close to hiking trails. There's no restaurant in this place. Located in Tatranská Lomnica resort in High Tatras, 900 metres from Lomnica ski slope. Perfect place for skiers and hikers. This comfortable hotel offers SPA facilities, swimming pool and fitness center. There is also a restaurant serving delicious food (not many vegan options though). One of the best hotels in High Tatras. Located in Štrbské Pleso mountain resort, 100 metres from the lake. Offers great panorama view on High Tatras and Štrbské Pleso lake. There are also SPA facilities and saunas. Breakfast is included. One of the best hotels in Zakopane centre, located only 5-minute walk from Krupowki street. Comfortable rooms pleasant to stay in and relax. Aries Hotel & SPA offers also Fitness center, SPA and swimming pool. There's a restaurant in the hotel (breakfast included in the price). Nice and clean accommodation with a fully equipped kitchen, located in a quiet area close to hiking trails. A budget-friendly option for people looking for Zakopane getaway. High-end Zakopane hotel SPA. It's expensive but worth the price. Staff is very friendly, the rooms are spacious and clean, food at the hotel's restaurant is delicious.